Hot-dip vs Cold Galvanizing: What’s the Difference? Takeaway: As the corrosion control industry adopts new coating technologies, the debate continues regarding best practices in steel surface preparation requirements and profile height for new, thicker coatings. Driven by a need for increased coating life where new ultra-high-build (UHB) coating technologies are used, surface profile is a regular topic of conversation with contractors and inspectors. There are many inconsistencies in the industry with profile requirements for these super-thick coatings. In an attempt to understand the effect of surface profile height on the adhesion of UHB epoxies, Blast-One International conducted testing of one coating on steel panels with different profile heights and different total coating thicknesses. This research is described below. Join thousands receiving the latest developments in corrosion technology industry. By looking at the findings of this and other studies, and comparing them with traditions in the industry, it is easy to see where misunderstandings can occur with protective coatings contractors. Coatings contractors have much on their minds while on project sites. Surface profile and surface cleanliness are so important; the old saying goes that “a coating is only as good as the surface preparation.” With that in mind, it is time to pay attention to the surface preparation as a whole. We have some evidence to clarify the effect of high or low surface profile and to clear up the myth that a higher surface profile is necessary to increase coating adhesion. This study is a start to increase our understanding and reduce confusion on best practices for surface profile. Abrasive blasting creates peaks and valleys, thereby increasing the surface area to provide a better bond between the coating and steel substrate. We have always thought that an acceptable increase in surface area was about 33%. More recent studies have shown that it is more likely to be 16–18%, but this is still being verified by independent testing. The assumption is that by blasting the surface, some cleaning will take place, which will remove contaminants that would impede adhesion between the coating and the substrate. Surface profile is also known by other names, such as anchor pattern and surface roughness. Classifications of surface roughness include maximum roughness depth (R-max); roughness average (R-a); and total peak to valley profile height (R-t). For the technically minded, the coatings industry has typically measured R-t, which is the total height from the lowest valley to the highest peak in a given area. The R-t measurement has some limitations because it is affected by rogue peaks, but it is a generally accepted method of measuring the surface profile in the coatings industry. This webinar will provide an overview of the two main types of wet abrasive blasting. Get a better understanding of how each technology works as well as the advantages and disadvantages. Another confusing aspect of surface profile is units of measurement. 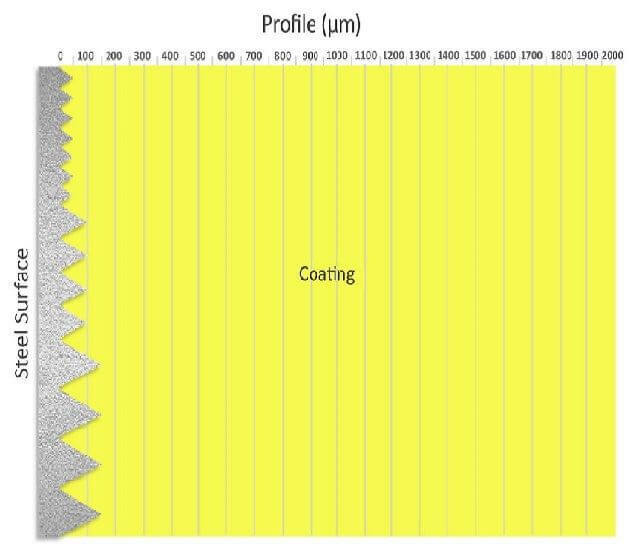 For example, some coatings suppliers in Australia ask for a profile of 88 microns. Eighty-eight microns is an unusual number, which appeared simply from the conversion from mils or thous (thousands of an inch) to microns. In other words, 3.5 mils equals 88 microns. 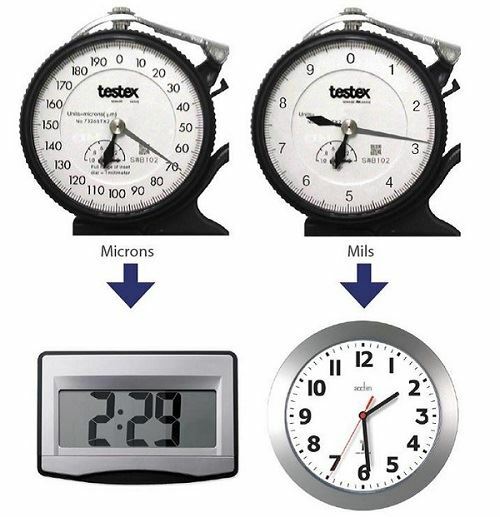 Many of the specifications and data sheets that we use today are converted from the United States, where Imperial units like mils/thous (1/1000 of an inch = 25.4 microns) are commonly used. When we measure profile and the specification has been converted from an Imperial standard (for example 2.5 mils) to the equivalent metric standard (i.e. 63 microns), it’s a little bit like comparing analogue time with digital time. Figure 2 – Lost in Translation? If we say, “I’ll see you at half past 2,” and in reality the meeting started at 2:26 or 2:34, no one would really mind. But if it is digital and you say the meeting starts at 2:30, in that case 2:29 is early, and 2:31 is late. These challenges that confront the industry are merely pointed out as areas that leave clients, contractors and inspectors in a position where they feel that they need to make their own interpretation. They are making on-the-spot decisions, all with good intent, but these decisions may have the hidden effect of unnecessarily costing someone, often the contractor, a lot of money. In Part 2 of this article series, the author explores five independent studies with relevance to whether higher surface profile increases coating adhesion. In addition, results of a test conducted by Blast-One are presented along with interpretations that have bearing on determining best practices for surface preparation. Jim Gooden has been involved with the corrosion control industry since 1989. He aspires to improve the quality of corrosion prevention projects through educating the various players involved. As technical director with the Blast-One International Group, he leads the global project team responsible for reducing the cost of corrosion control. Where can I find a coating that is chloride and sulfur corrosion-resistant? Are there any OSHA regulations that need to be taken into account when using thermal insulating coatings? With respect to CUI, how well do thermal insulating coatings retard the spread of corrosion?